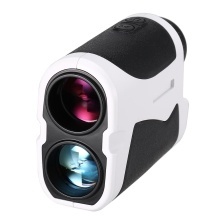 This Laser Rangefinder, with 6X magnification and multi-layered optics, lets you see most objects clearly with a max range of 400 / 600 / 900 / 1200 meters without having to get closer. Its multiple modes (Distance, Angle, Horizontal distance, Vertical height) bring you amazing experience and fun in different practices. You can switch the measurement between meter/yards as you wish. The compact palm size and light weight make this rangefinder convenient to carry without adding extra bulk to your bag. Hold it in your hand and go to explore the outside world! Measures a long range up to 400 / 600 / 900 / 1200-meter with an accuracy of +/- 1 yard. Displays distance, angle, horizontal distance, vertical height through the easy-to-read lens. 6X magnification and fully multi-coated optics guarantees clear images without any color difference. Easy to adjust diopter and sharpen the image captured, convenient to measure the target. Simple two button design allows you to fast switch between measurement unit (meters/yards), very easy to operate. Measures just 4.0" * 3.0" * 1.5" and weighs only 6.3oz, perfectly fits in your pocket without extra weight. Comes complete with a hand strap, carrying pouch, quick user guide. Great for golfing, hunting, surveying, mountaineering, sporting events and outdoor adventures.